Fresh farmer’ bread and the various savoury and sweet regional specialities have convinced you during your stay with one of Stubai’s farmers? Then you will find recipes and all kinds of tasty dishes to try out yourself, allowing you to take home a piece of the delicious Stubaital. We wish you the best of success! Put the cherries into a pot and boil them briefly using 0.1 litres of water. Subsequently, mix the fruit using an immersion blender. Then add the gelling sugar. Let the fruit simmer for 5-7 minutes and then blend the mass again. Add a teaspoon of rum and a shot of citric acid to retain the beautiful red colour. 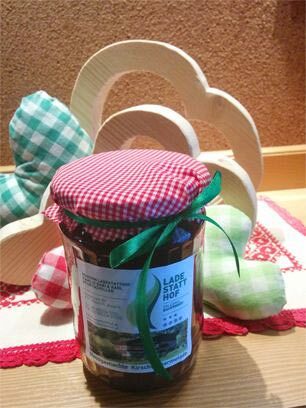 Now you can fill the hot jam into jars. Store them upside down to guarantee durability. Gabi & Karl of the Ladestatthof farm!